Winter Holiday Spending Per Capita #Infographic ~ Visualistan '+g+"
The winter holidays are a time when family and friends come together to celebrate, party and reminisce. It’s also a time when we spend astronomical amounts of money on gifts for those loved ones! You may wonder how much you should be spending on gifts every year, or how much others in your area spend on gifting. 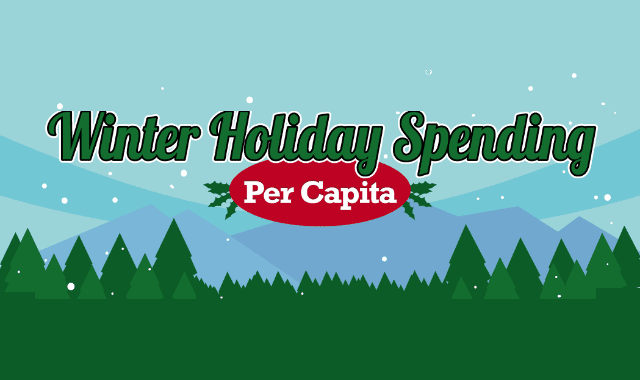 This graphic explores the winter holiday spending trends of each US state, per capita. This graphic will help you decide if you’re on track with your spending compared with others in your state, as well as the rest of the country. For example, Oklahomans spend about $800 per capita on Christmas, while folks in New Hampshire spend more than $1500 per capita. It begs the question of how much of a role the local economy plays in holiday spending, as well as factors like each state’s sales tax rates and average income per capita, and the overall values of the people of each state. Explore the winter holiday spending trends of each US state per capita, and see how your state ranks.